There’s something magical about the holiday season in Champaign-Urbana, for kids and parents alike. The twinkling lights, the fresh snow (if we’re lucky), and the excitement in the air all make this a memorable time of year. Here you’ll find one gigantic roundup of Champaign-Urbana Christmas parades, holiday show and concerts, Champaign-Urbana Santa meals, calls, and photos; where to see a live nativity; where to find a local Christmas tree farm; a Holiday Lights tour and more… all in one easy spot. Of course, some of our content will be added as the season continues. 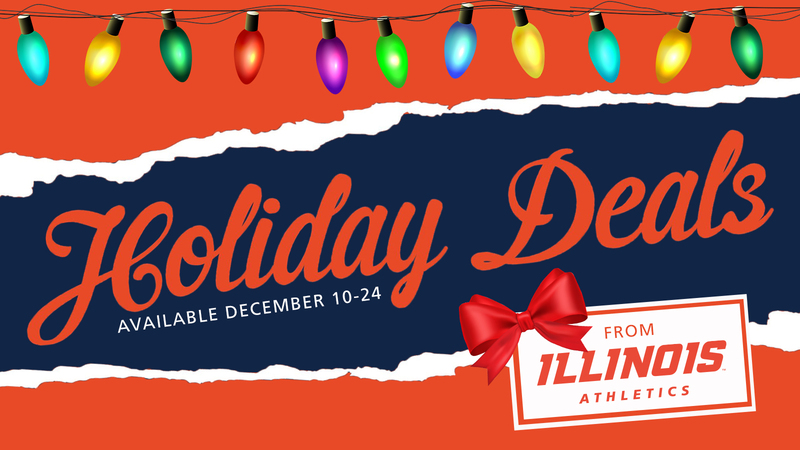 Thanks to University of Illinois Athletics for sponsoring our Gigantic Holiday Fun Guide in 2018. Fighting Illini Athletics has great deals for the whole family this holiday season! Check out these three deals running Dec. 10-24. Men’s basketball: 2 tickets for $20 on Feb. 5, 2019, vs. Michigan State; women’s basketball: $3 ticket deal for National Girls and Women in Sports Day on Feb. 10, 2019, vs. Wisconsin; football: $10 mystery ticket on Sept. 21, 2019, vs. Nebraska. Pin this page, post this to Facebook, save the link to your homescreen, or bookmark this link because this is one page you’re going to want to come back to over and over again for the holidays. 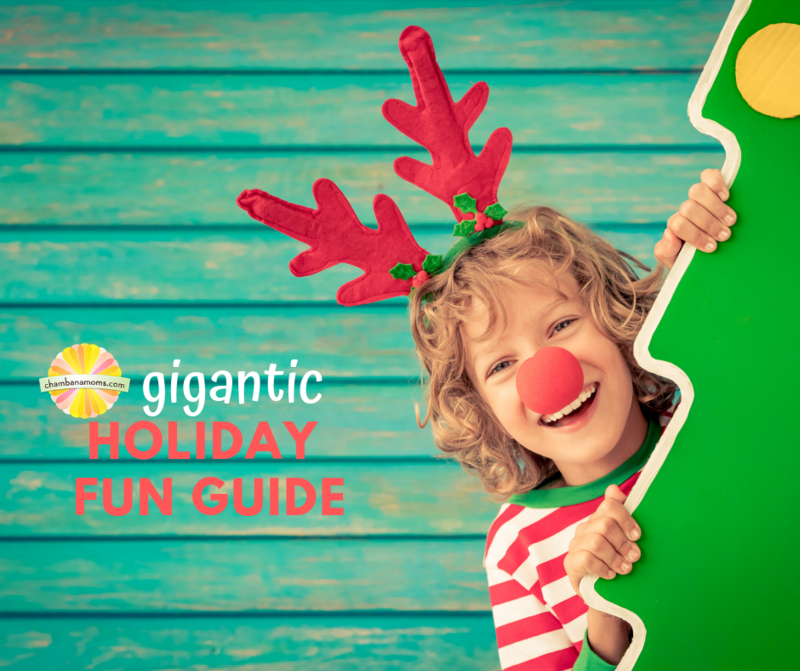 Want more info on Champaign-Urbana holiday fun for your family? Sign up for our Ho Ho Holidays email newsletter, and you’ll get 24 days of holiday info in your inbox, starting Dec. 1. If you are trying to make each day count this holiday season, this section is for you. The holiday season gets busy, so we have done the planning for you! Be sure to check out our calendar to see a different activity each day that your family will enjoy. If you are looking for something free and close by, check out your local libraries. Many branches hold different events to help you fully enjoy the holiday season. Santa. Trains. Twinkling Lights. Parades. These five words inspire excitement in kids (and parents!) of all ages. You’ll find all of these in our lists for Champaign-Urbana holiday traditions this year. Don’t forget about Thanksgiving. For some families, turkey trots are an annual tradition – a fun way to make memories. If you prefer to eat Thanksgiving dinner outside the house, you have options. You might not think about fun when you think about shopping. For some, it’s a chore. For others, it’s an enjoyable part of the season. Be sure to check out our shop local trail, and mark your calendar for our Holiday Hullabaloo Shopping Day on Dec. 6. CHANUKAH happens early this year. Find out where and how to celebrate. Want a phone call from Santa? You can set that up! How will you be celebrating the holidays? No matter how you choose to spend the season, we hope it is full of love, light, laughter, and joy.